With my husband being away last month and having no time to blog, I'm finally getting around to my favourite products. While there's not a lot of them, 5 of them are new products that I can't wait to share with you. 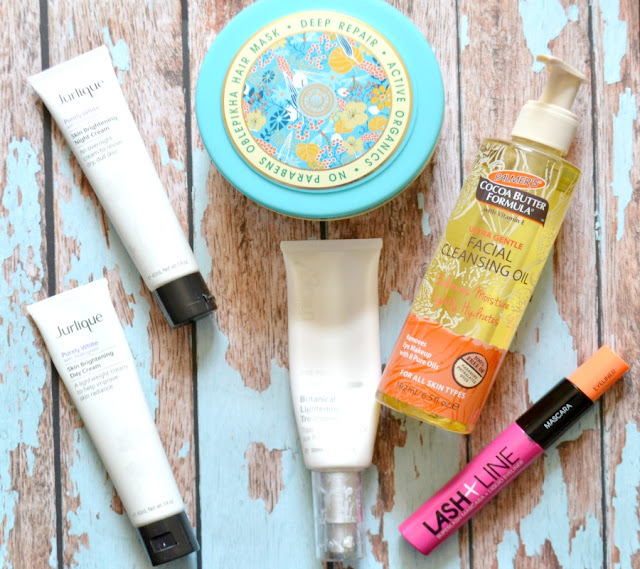 Getting rid of older products has given me the opportunity to try out some new products. One of those has been the Palmer's Facial Cleansing Oil. I picked this up from the supermarket when it was 50% off and after the first use, I regretted not picking up more. This has kicked my beloved Dr LeWinn's 4 Fusion Cleansing Oil off of its number 1 place as my favourite cleansing oil. It has that gorgeous Palmer's cocoa scent. It works amazingly at getting rid of make up and doesn't leave any oil on my skin. It's also one of the few drugstore/supermarket oil cleansers that doesn't contain mineral oil. You need to pick this up if you've never tried an oil cleanser before. Some products you instantly fall in love with (like the Palmer's cleansing oil) and then there are other products that take a while to warm up to. When I first tried the Trilogy Botanical Lightening Treatment,* I liked it but it wasn't until I started seeing results that I fell in love with it. After using it for about 4 weeks I noticed that my hyperpigmentation was reducing and my complexion has more of an even tone. The more that I use it, the more that I adore it. I also like the fact that it's a lightweight cream. It sits under my make up nicely and it will also be great for summer as it's light on my skin. Continuing on with brightening products, I was sent some products from the Jurlique "Purely White" range. I've been slowly introducing them into my skincare routine over the last month and have really seen a difference to my skintone. I've been using the Jurlique Purely White Skin Brightening Day Cream* every morning and the Jurlique Purely White Skin Brightening Night Cream* every second night (I use the Alpha H Liquid Gold on alternate nights). Once I've finished the Trilogy serum, I'll start using the serum from the Purely White range. I was also sent the cleanser from the Purely White range, but I've found that sometimes it feels a bit too dry for my skin. The weather in Adelaide has been very strange with one day 30 degrees and sunny then the next day it's 18 with rain, so I'm not sure if that's affecting my skin and that's why sometimes the cleanser feels dry on my skin. I just bought the Jurlique Rose Moisture Plus Daily Moisturiser Cleanser last week and have been switching them around depending on how oily or dry my skin feels. I picked up the Natura Siberica Oblepikha Hair Mask For Severely Damaged Hair from Chemist Warehouse back in September and instantly fell in love. It leaves my hair feeling so incredibly soft and smooth. I've ran out of it and will be picking up another one this week. I'm tempted to purchase more from their haircare range (they also do body products too) but I really need to finish some of the hair products that I already have. If you follow me on Instagram (see here) you'll notice that a lot of my MOTD posts contain the same things and that's because I'm trying to use up my make up and finally finish them! So I don't have a lot of make up favourites as I'm a bit sick of wearing the same products day in, day out. But one product that I still love is the ModelCo Lash & Line Superlash Mascara + Liquid Liner. * I don't use the liner often as I'm normally rushing around trying to get ready with a baby in one hand, but I've been using the mascara nearly everyday for the last 2 months. I really need to buy a new one as this is starting to clump up and go past the 3 month mascara use by date. Hopefully you enjoyed hearing about some new products! Has there been anything that you've loved recently? Natura Siberica makes such lovely products! You need to try their body scrub, if you haven't yet! The Natura Siberica hair mask sounds lovely. I'm so keen to try that brand and see what all the fuss is about! I've only tried the hair mask but I've heard so many people rave about their body products.